Hi, there! Welcome to Flawed yet Functional where I care a whole lot about healthy and delicious food (gotta be both!!). I am an insulin-free Type 1 Diabetic (What?!?) controlling my blood sugar through the Autoimmune Protocol diet, exercise, and healthy habits. Cooking is a huge part of my life, and I love creating yummy new recipes that meet my dietary restrictions and are delicious to eat. Today I’d like to share a new soup I’ve been making recently: Cream of Cauliflower Soup with Smoked Kielbasa. A month or so ago I decided to give the keto diet a try. I personally know one other insulin-free Type 1 Diabetic, and her diet is keto. However, I had to layer on my food sensitivities with the keto lifestyle. This means dairy and eggs are out which are staples of the keto lifestyle. To keep my carbohydrate count low for the day, I’ve been focusing on low-carb vegetables. One of those is cauliflower (really all cruciferous vegetables). I’ve been preparing cauliflower all kinds of ways, but mashed or creamed like in this soup is probably my current favorite. The other tragedy that lead to this recipe is a not-so-delicious batch of homemade kielbasa. My husband and I have been making our own sausages for about six months now. Traditional kielbasa is AIP-friendly as the only spices are garlic, marjoram, salt, and pepper. Unfortunately, ours did not turn out too good. The texture is off (meat not ground enough?) and the flavor is just kind of blah. For a while, the whole batch was just sitting in the freezer while we dreaded eating it. Then I tried a mashed cauliflower soup and thought the kielbasa would pair perfectly. It did!! A little tweaking to the original recipe and adding meat makes this light, quick soup an instant favorite in our house. I also love that we have a use for all this kielbasa, and we aren’t choking it down! 🙂 Ha! For those of you who don’t make your own kielbasa, no worries. Just pick up some smoked kielbasa from the grocery store or butcher. Smoked kielbasa is fully cooked, so toss it in the soup once it’s finished just for a few minutes to warm it up. If you are able to buy it raw, then be sure to cook/smoke it before slicing and adding to the soup. The best thing about this recipe is it’s done in 30 minutes. Woot! An AIP, Paleo 30 minute meal? That’s a huge win in my book. 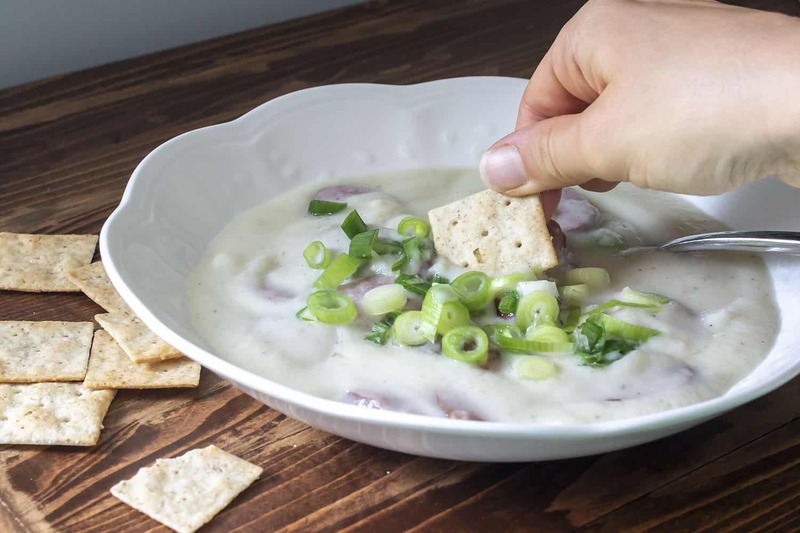 This creamy soup is dairy-free and gluten-free. 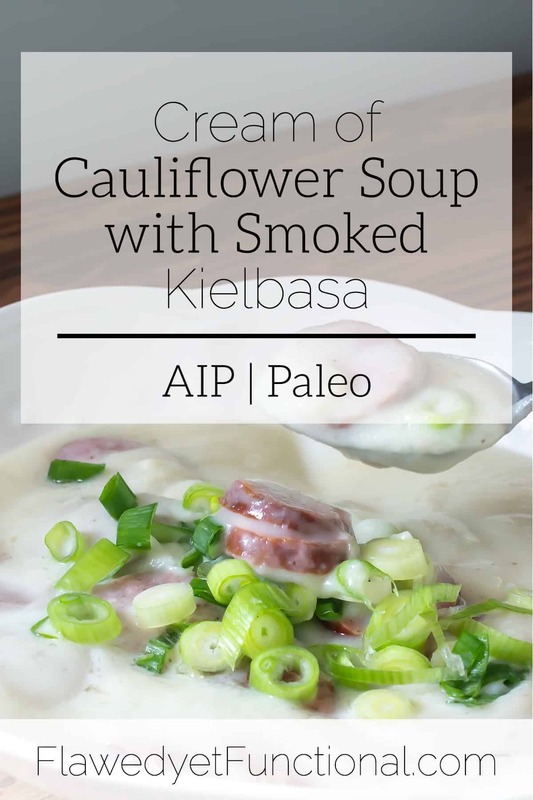 Kielbasa is also AIP-friendly so enjoy this soup if the Autoimmune Protocol or Paleo is your diet of choice. Prepare the vegetables and meat by dicing the onion, mincing the garlic, slicing the kielbasa, and chopping the green onions. In a dutch oven over medium heat, add the olive oil and saute the onion until beginning to brown and release liquid. Stir in the garlic to bloom, about 30 seconds. Pour in the bone broth and scrape any browned bits from the bottom of the pan. Add the cauliflower, cover, and simmer over medium-low heat until cauliflower is soft, about 10 minutes. Put all contents of dutch oven into a blender and puree until smooth (work in batches if necessary). Pour cream of cauliflower soup back into the dutch oven. Stir in the kielbasa, salt, and pepper. Allow to warm for a minute or two then taste and adjust seasoning. Serve hot topped with chopped green onions. Enjoy!